There are only two qualities necessary for success in reaching your fitness goals. Luckily for me, they are not willpower and motivation (or else most of us mere mortals would be in trouble). It's consistency (show up, do the work) and patience (keep going over the long haul). If we make positive changes in our lifestyle towards our goals and we keep going and growing, over time we can achieve almost any goal. People fail not because they didn't have enough willpower or motivation, they fail because they quit or give up too soon. Too many programs promising twelve week transformations has put an unrealistic expectation on what can be achieved in a short period of time. Yes, you can make massive progress in twelve weeks, but you must keep going once those twelve weeks are over. You may not go from 20 pounds overweight to six-pack abs in that time period. It may be possible, but not probable or sustainable. You can achieve your goal if you're both persistent and patient. 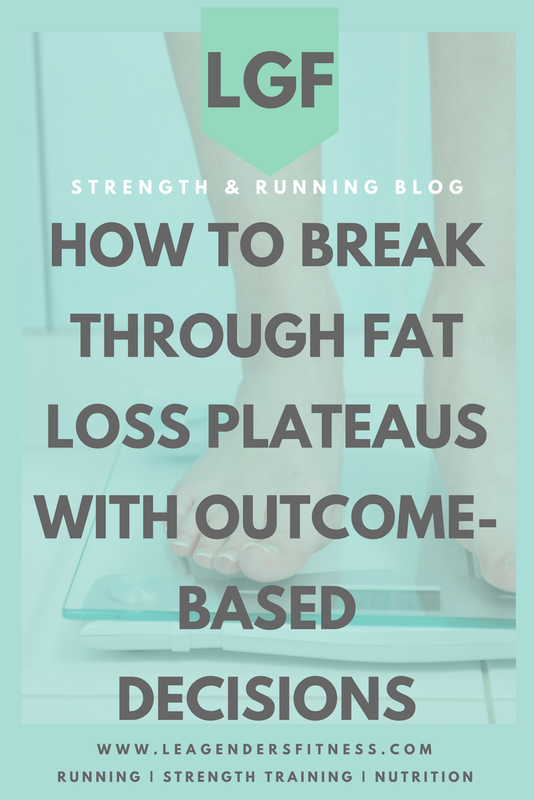 how to break through plateaus with outcome-based decisions. Save to your favorite Pinterest board for later. People often get frustrated with plateaus, but plateaus are not necessarily a negative thing. It's how our bodies work. A plateau means that your body has adapted. It's signaling you that it's time to take the next step. Thank your body for that signal instead of cursing it for slowing or stopping progress. You can't outsmart the body. To cut your calories extremely low in order to drop fat faster is akin to turning up the temperature in the oven to cook your turkey faster. It's just not how it works. Your body will likely rebel just like that turkey would burn. Remember, you must have both consistency and patience. If the extreme or prohibitive nature of your program prevents it from becoming a part of your lifestyle, then it probably won't be effective long-term. There are a few principles that work for most people as a starting point. There is no one best diet. There is not any magic shake, pill, supplement or exercise program that will melt off all your fat. Start with these basic principles, then make adjustments based on your goals, values and lifestyle. If you don't have any of these dialed in, start with one or two and build. 1. Eat whole, unprocessed foods from nature most of the time. 2. Sleep well seven to eight hours a night. 3. Manage stress in a healthy manner. 4. Allow some room for planned treats and indulgences. It's called having a life = balance. 5. Create a calorie deficit to lose weight by slightly reducing the calories you eat. Don't cut too drastically. 6. Consume a moderate amount of healthy fats. Fats have more than twice the calories per gram than protein and carbs. It is possible to overeat healthful foods too. Nut butters, nuts, and avocados are healthy for your body but are calorie-dense. Definitely include healthy fats in your diet, but be mindful of the serving sizes. 7. Incorporate low intensity movement throughout your day, like taking the stairs or parking your car farther from the entrance. 8. Do resistance training to maintain and build muscle. Muscle tissue burns more calories at rest, so the more muscle you have the higher your metabolism. 9. Do cardio exercise (walking, jogging, bike riding) for a healthy heart. This is not an attempt to over simplify a complex subject, but if most people would start with the above principles and execute consistently over the next year, they'd get a lot further than strict diets and extreme workouts. Start with the basics and you can make adjustments based on your results. Monitor your progress and make adjustments based on the results. So how do you know the correct amount of calories and exercise? You approach it like an experiment. STEP 3. Decide what to do next, based on the results. The most important thing to remember is that there is no failure, only feedback to inform your next step. Start conservatively. Don't drastically cut your calories. Don't go from working out zero days a week to six days a week. If you go all in at first, you don't leave yourself any room to progress and your chances of burnout, injury or exhaustion go way up. Start small, then build, based on your results. There are a few major factors of the plan that could be manipulated: nutrition, resistance training, cardio training, rest/recovery. Choose one to manipulate at a time. Try it for a week or two then reevaluate. Is it working? When you are not getting the results you desire, look where you could next improve in nutrition, resistance training, cardio and recovery. Are most of your calories coming from unprocessed foods from nature? Can you improve the quality of your food? Are you eating proper portion sizes for your goals? Are you eating enough lean protein? Are you eating vegetables with each meal? Are you in a calorie deficit (for fat loss goals)? How many times a week do you eat at a restaurant? How many alcoholic drinks do you consume a week? How many indulgence meals a week? These are all areas of nutrition that can be fine-tuned for better results. Are you including two to three full-body resistance training sessions a week? Are you progressing over time, lifting heavier weights, increasing either sets or reps as you get stronger? Are you getting enough sleep? Are you taking enough time to recover from your workouts? Are you managing stress? Sleep helps balance hormones, control hunger and manage stress and shouldn't be overlooked as a factor in fat loss. We get stronger, faster and build muscle during the rest period after the workout, not during the workout itself. If we don't allow our body the proper time to recover, we won't see the full benefit from our hard efforts. Resting is not laziness, it's mandatory. More is not always better. If you start making positive changes to your nutrition and exercise habits, but then hop on the scale once a week to monitor your progress, you are not getting enough information to inform your next plan of action. I wouldn't recommend using a bathroom scale as your only means of feedback. The scale only tells part of the story: your total body weight. Here are three examples of how the scale can tell an incomplete story. You may be happy with a lower number on the scale, when it actually is a poor result. Or you may be upset the number isn't changing when in some cases that it is the most ideal result you can achieve. You could lose weight on the scale, but also lose muscle, and that would be a poor result. If you lose muscle while losing weight, you lower your metabolism which makes it harder to keep the weight off. You could stay the same weight on the scale for weeks on end, but have lost fat and gained muscle. That would be a positive result that is typically extremely hard to achieve. So congratulations if the scale isn't budging! If you are resistance training, you may be losing fat and gaining muscle! Take measurements and get your body fat % measured and you may find your weight isn't changing, but your body composition is improving. Remember we always want to focus on fat loss, not weight loss. You could gain weight on the scale that is muscle and that would be a positive result. As you can see a lower number on the scale is not always the ideal result. You need more information to know. What is your body fat percentage? What are your measurements? Are your clothes fitting too big? Are you sleeping better? Do you have more energy? Do you feel better? Are you performing better? All of these things need to be taken into consideration when determining how/if you need to adjust your nutrition and training plan. DexaFit and BodPod are considered accurate for measuring body composition, but expensive. That's great if you have the money, but I don't mind the inaccuracy of home body fat scales for measuring progress because the exact numbers don't matter. What matters is the progression over time. Same time of day, hydration levels, same day of cycle for women, etc. I recommend a scale like this, it's not perfect but accurate enough to give an idea of trends over time. An extremely inexpensive way to measure body fat is with skin fold testing. Again, the accuracy doesn't matter as much as the trends over time, as long as you measure under the same conditions every time. Take measurements of your thighs, waists, arms, etc. Maybe your biceps got bigger but your waist got smaller. This can all be positive progress depending on your goals. It's important to listen to your body's feedback. If you feel like crap all the time, your hair is falling out, your skin is flaky, you're breaking out in pimples and exhausted all the time, these are all signs your body is trying to tell you that what you are doing is not working. Learn to tune and in and honor the feedback your body provides. Are you stronger? More powerful? Can you run faster or more efficiently? How's your endurance? Is your performance improving? Have your blood markers improved? cholesterol, blood sugar, blood pressure, etc. How do you look in the mirror? Take progress photos to compare the differences that can be hard to spot in the mirror. The first step is not to freak out, no matter what the result. It's all feedback. You're learning what works best for your individual body. When you try a new strategy, give it at a week or two before making more changes. It can be a slow process, but when you view it an an experiment in a healthier lifestyle to determine what works best for your body, you may be able to find joy in the process, rather than just the outcome. Congratulations. Keep doing what you're doing. You're on the right track for now. Keep monitoring your progress. You're likely in a calorie surplus. Check your nutrition compliance. If you're not losing fat, you may try to increase resistance training and cardio in either intensity, duration or frequency. Not everything at once, please. You may try to reduce calories/portions slightly unless already on the low end of calorie intake (remember reducing calories too low could backfire). You may need to increase calories, protein and resistance training, or maybe reduce cardio a little bit. We want to hold on to our muscle tissue for the best results. You could make adjustments to your nutrition intake (add protein) and training program (increase resistance training) so that you maintain or build lean muscle. Congratulations. You're doing the hard work to find out what works for your individual body. It's a hellofa lot more effective then guessing or pushing your body to extremes with no rhyme or reason. If you're assessing and not guessing, you'll always be on the right track. Have questions? I'd love to help. Like this post? Do you know someone who might benefit? It helps me when you share with your friends and followers.